In the years that followed the end of World War II, the United States experienced an unusual cultural trend: Polynesian Pop, more commonly known as Tiki. Along the West Coast and in areas nationwide, Tiki bars with thatched roofs began serving Mai Tai’s, and playing exotica music over the loudspeakers. While there were many factors that contributed to the mid-century Tiki craze, the experiences of World War II veterans helped to build Tiki into the industry that continues today. While Tiki exploded in the years following World War II, America’s first true Tiki bar and restaurant opened in 1933 under the name Don the Beachcomber. Opened by Prohibition bootlegger Ernest Raymond Beaumont Gantt, Don the Beachcomber was the culmination of Gantt’s worldwide travels. Having spent nearly ten years travelling throughout the Caribbean and Polynesian islands, Gantt returned to Los Angeles in 1931 with no real plan, or a career. The menu of LA’s Don the Beachcomber, the bar that played a vital role in the creation of Tiki Culture. Reprinted from California Tiki: A History of Polynesian Idols, Pineapple Cocktails and Coconut Palm Trees by Jason Henderson & Adam Foshko, courtesy of Wikimedia (pg. 27. The History Press, 2018). Cantonese Pork: Thinly sliced tenderloin of pork rolled in egg batter and sautted with pineapple and green peppers. Chicken Almond: Tender chicken cooked with mushrooms, bamboo shoots, celery, onions, and water chestnuts. Chungking Shrimp: Shredded shrimps cooked with pork, water chestnuts, eggs, and green onions. Mandarin Duck: Boned, molded, crisped in peanut oil, and seved with wild plum sauce. Beef Soyo: Tenderloin of beef sautted in soyo sauce with water chestnuts, onions, and bamboo shoots. Although his dishes and drinks were far from authentic, the faux-tropical drink and dinner menu was a hit with Los Angeles locals and Hollywood elite: Frequented by figures such as Charlie Chaplin and Neil Vanderbilt, Gantt’s bar was a local treasure, and represented what many of its wealthy patrons had experienced while abroad. However, the Polynesian themed bar didn’t develop truly universal appeal until Gantt (who later legally changed his name to Donn Beach) left for service in World War II, leaving his bar in the hands of his wife and business partner. Under her leadership and the after-effects of World War II, Tiki (and Don the Beachcomber) truly began to flourish. Although history may recognize the Pacific theater of World War II for being particularly violent given its use of nuclear technology, soldiers (and in particular, Navy sailors) often got a taste for island life during tours stationed in exotic locations like Bora Bora and Hawaii. Unlike the typical hustle-and-bustle of American culture, soliders found that the islands adopted a calmer, more laid-back lifestyle, which became appealing to men as they searched for some respite from the frenzy of war. As a result of their experiences abroad, soldiers and sailors alike came back from active duty raving about their adventures in tropical locales, and with a desire to recreate their exotic Island experiences on the US mainland. 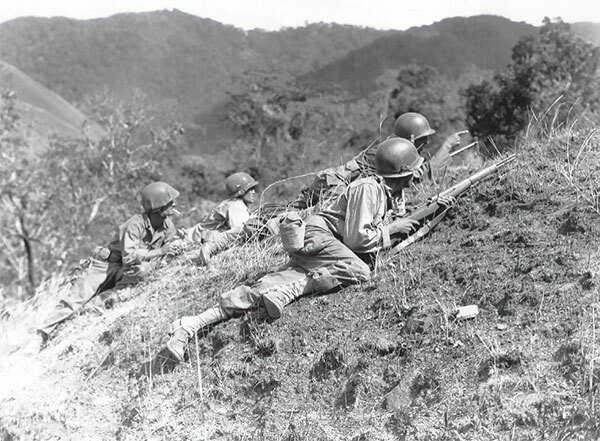 American forces at the Battle of Luzon, 1949, one of many battles of the Pacific theatre during WWII. Reprinted from California Tiki: A History of Polynesian Idols, Pineapple Cocktails and Coconut Palm Trees by Jason Henderson & Adam Foshko, courtesy of Wikimedia (pg. 19, The History Press, 2018). 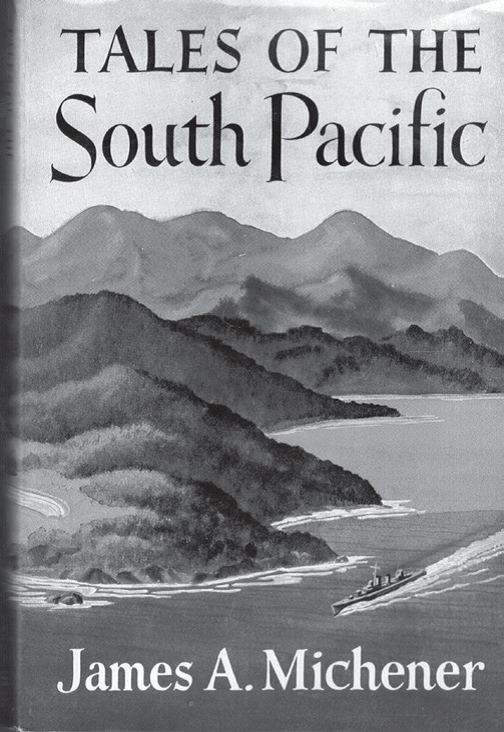 The experiences of Pacific theater armed forces were recounted in various ways following the war, but were most prominently represented in James A. Michener’s novel Tales of the South Pacific. Based largely off of Michener’s own experiences while deployed in the New Hebrides, the novel attempted to depict many aspects of Polynesian culture to the American people. However, Tales of the South Pacific was most successful at capturing the “return to innocence” that many Americans were desperate to salvage after the jarring intensity of the war. This return to innocence would come, readers believed, through the concept of “Bali Ha’I,” a fictional island, perfectly happy and tranquil, which was always visible on the horizon, but couldn’t be visited. 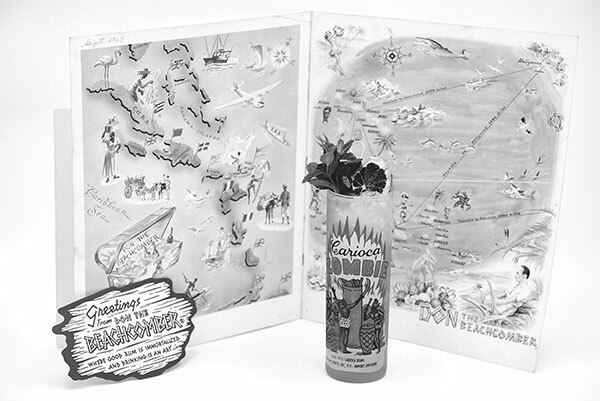 Bali Ha’I illustrated what people felt had been lost during WWII, and Tiki presented itself as a way to relax, if only for a moment. James Michener’s account of fighting men clowning around between terrifying battles on a small island, just two years after the war. Reprinted from California Tiki: A History of Polynesian Idols, Pineapple Cocktails and Coconut Palm Trees by Jason Henderson & Adam Foshko, courtesy of Penguin Random House, 1947 (pg. 20, The History Press, 2018). Michener’s novel was massively influential after its release, even leading to a Rogers and Hammerstein musical based on its content. The impact of Michener and other veterans, combined with a post-war economy boom, was reflected in a sudden surge in Tiki. A large portion of Americans soon became obsessed with Tiki style, especially on the West Coast (with a close geographic proximity to Polynesia). For establishments like Don the Beachcomber, this meant exponential growth to sixteen different locations, and the appearance of competitors nationwide. However, the obsession with Tiki extended much further than just bars and restaurants, and Tiki style also figured heavily into popular music and movies. Music genres like exotica, which attempted to combine musical elements with exotic sounds like bird calls, portrayed the sounds of a jungle island, and came to account for a quarter of all music sales during the 1950s and 60s. Records like Martin Denny’s Exotica and Les Baxter’s Le Sacre du Sauvage (The Ritual of the Savage) subsequently topped music charts. 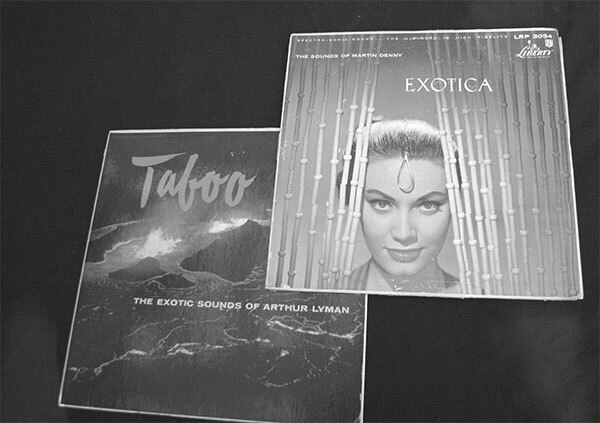 Two of the masterpieces of Tiki music: Martin Denny’s Exotica (1957) and Arthur Lyman’s Taboo (1958). Reprinted from California Tiki: A History of Polynesian Idols, Pineapple Cocktails and Coconut Palm Trees by Jason Henderson & Adam Foshko, courtesy of Liberty Records and HiFi Records (pg. 30, The History Press, 2018). In movies, Tiki came to be associated with American surf culture, and movies like Gidget, which depicted a young girl joining the mounting surf culture under the influence of the Big Kahuna, a war veteran who chooses to ignore society within a tiny grass hut, became massive box-office hits. Including the major tenets of American Tiki, these movies helped to build the future surf culture of the 1960s and 70s. While the influence of the veterans of World War II and Donn Beach have faded, Tiki culture has not, even making a comeback during the late 20th and 21st centuries. This comeback began with Beach’s death in the late 80s, which led to bartenders nationwide attempting to return his drinks to the list of classic American cocktails. Beach, who is credited with inventing 84 different Tiki cocktails, passed away in Honolulu, Hawai’i in 1989. 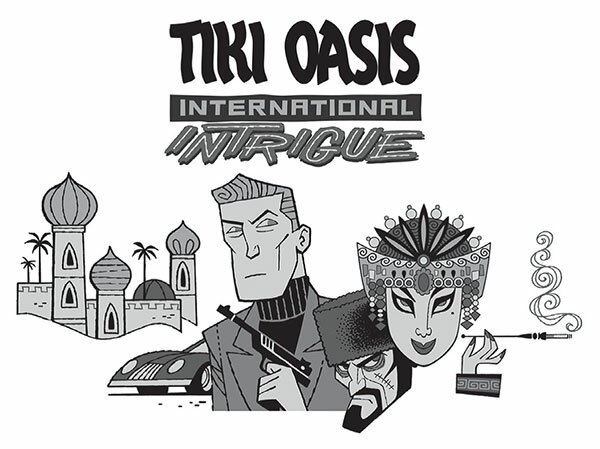 Tiki Oasis features themes – 2017 was all about international intrigue. Reprinted from California Tiki: A History of Polynesian Idols, Pineapple Cocktails and Coconut Palm Trees by Jason Henderson & Adam Foshko, courtesy of Tiki Oasis (pg. 95, The History Press, 2018). Tiki’s comeback has not only been linked to Beach’s exotic and delicious drinks, however. Modern trends have focused on reviving “retro” styles from the 1950s and 60s, when Tiki was considered fashionable. Modern fans of Tiki culture can take part in conventions like Tiki Oasis, the world’s largest Tiki festival, and Tiki bars can be found as far-flung as New York City and Miami, rather than just in its West Coast roots. Although the hey-day of Tiki may have passed with the mid 20th century, the love of island life lives on in the States, where the style still represents an escape from the pressures of modern society. With the help of veterans like James. A Michener and entrepreneurs like Ernest Gantt, Tiki remains a mainstay of American culture, offering an island vacation to Bali Ha’I to all those who choose to pursue it. To read more about Tiki culture’s growth and popularity in America, be sure to purchase your copy of California Tiki: A History of Polynesian Idols, Pineapple Cocktails and Coconut Palm Trees by Jason Henderson & Adam Foshko! To learn more about American music and entertainment, visit Arcadia Publishing today. Did you embrace Tiki culture in its heyday? Do you still love it today? Let us know in the comments below!